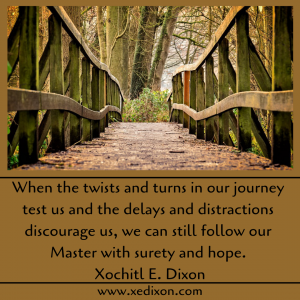 This entry was posted in Blooming in Christ and tagged Encouragement, Trusting God by Xochi E. Dixon. Bookmark the permalink. I’ve been a Christian since a child, but the whole servant’s heart vs. self-serving struggle will probably continue as long as I’m on earth but the intentionality of servanthood, of chosing beforehand whom to serve helps with that. Not waiting until a situation arises and the trying to decide in the moment doesn’t work well. Thank you for your encouragement to. S.P.R.A.W.L. Amen! The road is a whole lot less rocky when we are committed to surrender, to serving the Lord as we live for Him one submission at a time. It is hardest for me to listen and know if it Gods will – or mine! Thanks for your encouragement. You are not alone, Sister. Obedience is not easy. Lord, please help us trust You and surrender to You as You empower us to walk with You! Ohhhhhhhhh, THIS IS SO GOOD!!!! I sure needed to hear this, thank you!! Thanks for your encouragement. I needed the reminder, too. I’m so thankful we’re on this journey together, Sister.